I’m not particularly fond of our schools cafeteria. While we are blessed with a buffet catered by Bon Appetite for every meal, it just gets boring and everything starts tasting the same. The pizzas, pastas, salads, soups, etc. Oh, except for when they have tacos for lunch, those are legit. However, this buffet system has its perks. I typically bring large gallon size freezer bags to the cafeteria and fill them with miscellaneous items, such as fruit or cookies to snack on, cereal, or cream cheese to make cream cheese frosting or cheesecake. On some occasions maybe more than I will admit, I forget to bring a baggie and “borrow” a plate or bowl or cup to fill things with and return it at the end of the semester. Every Friday night, the caf serves a dessert of either pizookies, brownie-zookies, or cobblers with ice cream and an array of toppings. There are sprinkles, caramel sauce, chocolate and strawberry sauce, m&m’s, gummy bears, chocolate chips, just to name a few. 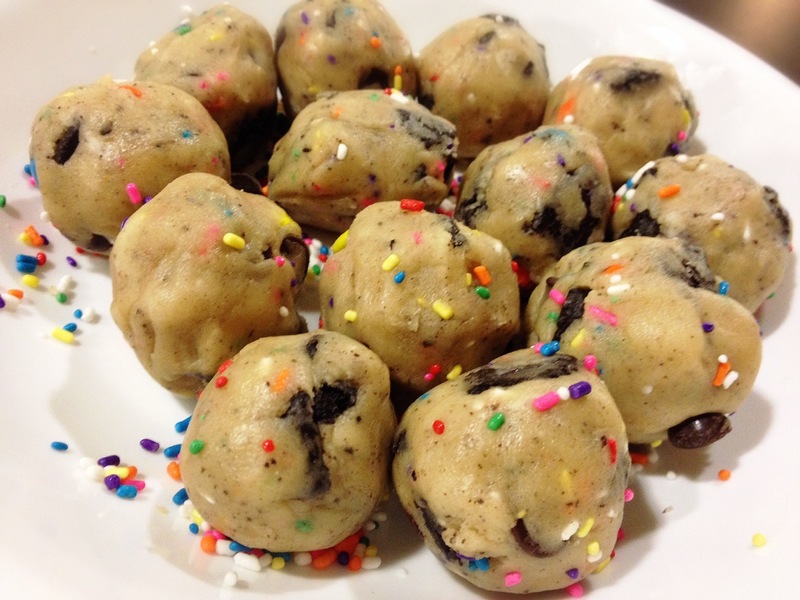 When I came across this recipe, I was just going to buy a small pack of oreo’s and sprinkles and use some chocolate chips that I had. But when I saw these at the caf for dinner, the asian in me knew I had just saved myself $7 or more. 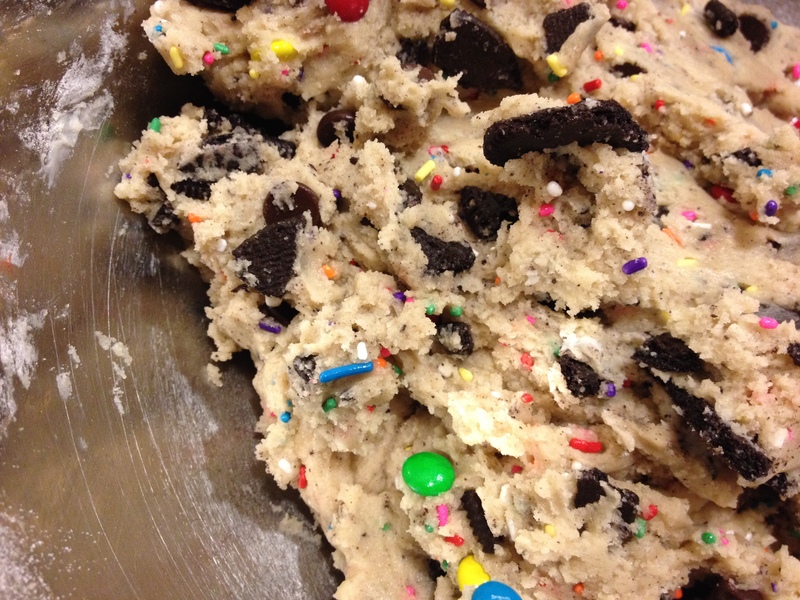 I brought back two bowlfuls of oreos, sprinkles, chocolate chips, and m&m’s to use in the cookies. Typically, I like to make everything from scratch. That way I know what is exactly in it, no preservatives, that kind of a thing. But the recipe I used is actually a semi-homemade recipe. 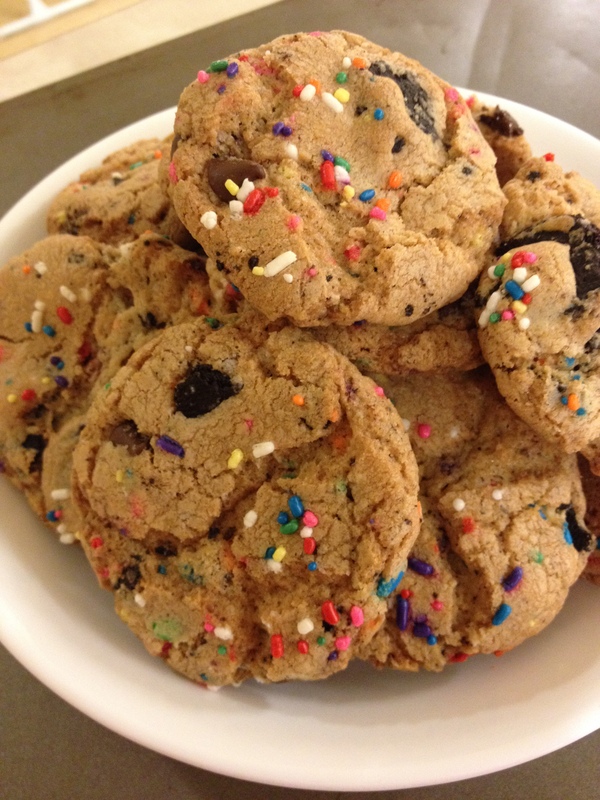 It takes some vanilla cake batter mixture and turns it into cookies! This recipe turned out really nice. 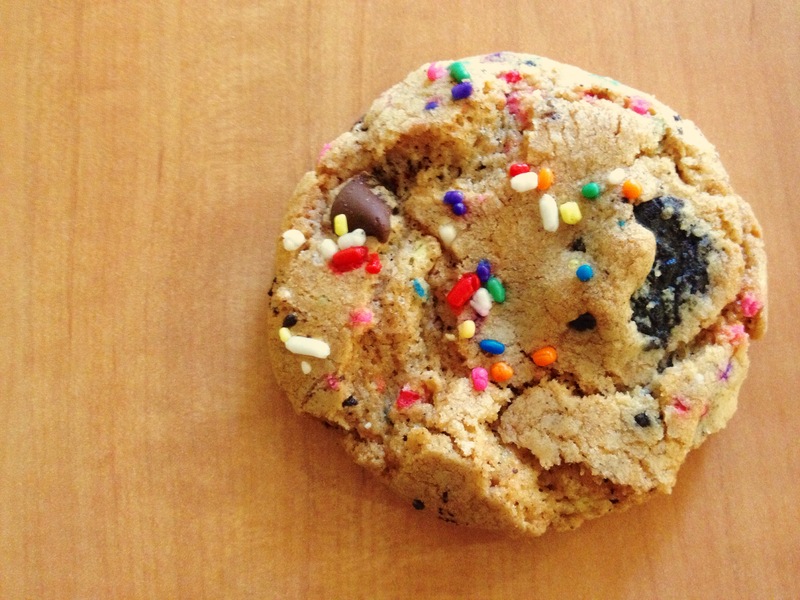 The cookies are thick with a good amount of chew to them, and each bite has sprinkles, oreos and m&m’s in them. Before I made these, I had originally wanted to remix them with a red velvet cake batter as well so there would be a red velvet swirl in it. However, I went to find the cake mix for red velvet and for some reason there was pink velvet, blue velvet, but no red velvet. Very confusing moment for me right there. I’ll def try it next time though! With a mixer, cream the butter and both sugars until well blended. Scrape down the bowl and add the egg and vanilla until well incorporated. Sift in the flour, cake mix, and baking soda until well combined and a dough forms. 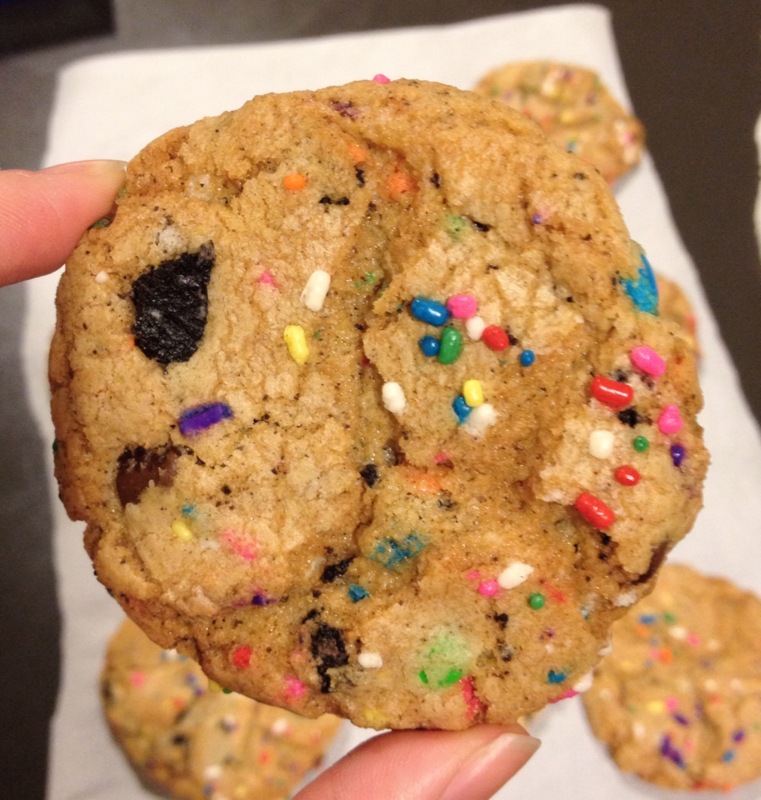 Mis in the chocolate chips, sprinkles and oreos until evenly distributed. Using an ice cream scoop, form the dough into balls. Cover and place into the refrigerator to chill completely so that the cookies do not spread out and flatten while baking. After an hour or two, preheat your oven to 350 degrees. Place the cookies on parchment paper and bake for 10-15 minutes until they are golden brown. Cool completely before feasting!